It is my great pleasure to attend today's ICBA seminar to discuss with Irish friends from the whole island about new opportunities for Sino-Ireland relations in the joyful time of the EU-China Tourism Year. I want to share with you some of my thoughts in four parts, China's latest wonderful situation in our development, new growth of our bilateral ties, our opportunities in tourism and importance of Sino-Irish joint efforts. Firstly, long-term and sustainable opportunities are coming from the momentum of China's bigger and deeper reform and opening-up. The 19th CPC Congress marked Chinese people's new journey of socialism with Chinese characteristics for a new era led by Chinese President Xi Jinping. The Two Sessions of NPC & CPPCC were successfully concluded in Beijing this month. Those events set out vision, strategies, guidelines and goals for China in our economic and social development very clear for 5 years, 15 years and 30 more years to come. As President Xi put it at the Closing Session of the National People's Congress, "Happiness comes with hard work." "Our aim is to build China into a great modern socialist country that is prosperous, strong, democratic, culturally advanced, harmonious, and beautiful by the middle of the century." China will undoubtedly deepen reform and broaden opening-up efforts and with more concrete measures. We also invited mutually-beneficial opening-up efforts from our partners worldwide. As our Premier Li Keqiang emphasized, regarding international trade and investment, in order to sail ahead in the same direction with our global economy, collective paddling is always needed. China has been and will continue to make its contribution to the global growth and development. The year 2018 is the 40th anniversary of China's reform and opening up. Remarkable achievements have been made through the past 40 years. In 2017, China's GDP for the first time reached 80 trillion RMB Yuan, accounting for more than 30% of global economic growth, and continued to rank No. 2 in the world. After we facilitated the application process of private passport in 2012, the total number of outbound Chinese tourists has grown to over 135 million in 2017 from only 70 million in 2012. According to the 13th Five-Year Plan, the total number of outbound Chinese tourists will reach 150 million in 2020. China readily welcomes our friends around the world to board the train of China's growth and the Irish tourism industry should not miss the opportunity. China will also continue to hold high the banner of peace, development, cooperation, and mutual benefit and uphold its fundamental foreign policy goal of preserving world peace and promoting common development. China will continue to actively promote the "Belt and Road" initiative, strengthen exchanges and cooperation with our partners and friends in the world as well as let Chinese reform and development benefit all mankind. China will continue to actively participate in the improvement and upgrading of the global governance, to contribute more Chinese wisdom, Chinese plan and Chinese contribution to build an open and inclusive, clean and beautiful world with lasting peace, universal security and common prosperity as a community with a shared future for mankind. Secondly, greater opportunities stem from the enhancement of China-Ireland bilateral relations. Recent years witnessed exciting progress in our bilateral relations with frequent high-level exchanges and strengthened cooperation across the board. In 2017, the bilateral trade volume reached 11 billion USD, 36.7% higher than 2016, which is the highest increase rate among all the EU members. The two-way investment also kept growing. In 2017, the annual flow of Chinese non-financial capital investment to Ireland is over 100 million USD, while Irish investment to China at the same period amounted over 150 million USD, with the growth rate of 350%. Irish government has announced to add Mandarin Chinese on the curriculum for Leaving Certificate students in 2020. 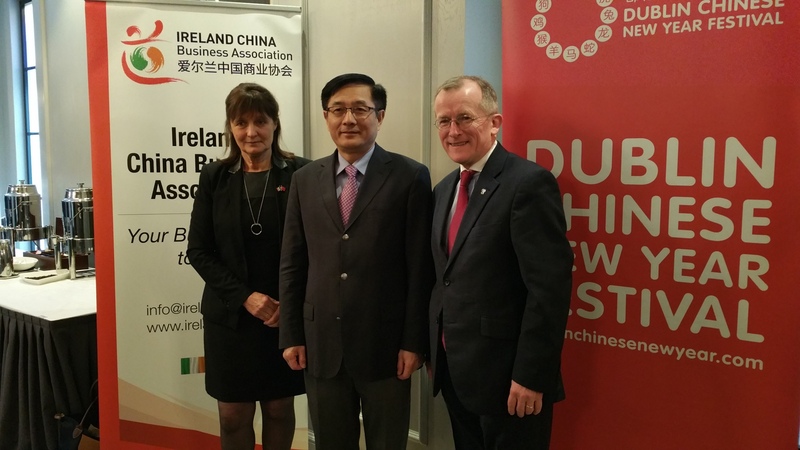 Good progress has also been made on Irish beef export to China. During the visit of Tánaiste and Minister for Foreign Affairs and Trade Mr. Simon Coveney to China earlier this month, he was warmly received by our State Councilor and Foreign Minister Wang Yi. In that meeting, Mr. Wang Yi praised Ireland as an important cooperative partner of China in Europe, and Mr. Simon Coveney expressed that Ireland is willing to be China's sincere and good friend in the European Union. They also brought a series of good news including the coming Beijing-Edinburg-Dublin direct flight of HNA in this June, the well-expected 5-year multi-entry business visa and 3-year tourism visa regime to Chinese citizens, as well as Ireland's participation in the first China International Import Expo (CIIE) in November in Shanghai. All of the above good news will create real opportunities for our bilateral trade and tourism cooperation. Thirdly, the strengthened exchanges in the tourism sector have laid promising foundation for our further expansion of cooperation. As you all can see, Ireland is rich in her tourism resources with your charming culture, ancient history, legendary landscapes, music and dance, delicious food and above all: the most hospitable and friendly people. Thanks to the joint efforts of both sides, Ireland has become an increasingly popular destination for Chinese tourists in recent years. According to statistics from Tourism Ireland, over 70 thousand Chinese visitors came to Ireland in 2017. In November last year, leading personalities from China's 19 provincial tourism administrations, travel agencies came to Ireland to hold the China Tourism Night, which received enthusiastic responses from Irish tourist communities. The other way around is also true: China is also a most charming country for Irish people to travel, and I would strongly recommend and encourage you to go to China more. She is large and vast, with such a nice and amicable, peaceful people, such a long and continuous history and civilization in the world. And what's more, there are Gaelic sports tournament now in China, and you can enjoy very good company there. On 14th February this year, I was honored to join Mr. Niall Gibbons and Lord Mayor of Dublin Mr. Mícheál Mac Donncha, in the "Ireland Sees Red" ceremony at Dublin City Hall. For the third year in a row, Dublin's best-known buildings have been illuminated in China Red to mark the 2018 Chinese New Year. The number of landmark buildings across Ireland lit up in "China Red" increased from 12 last year to 18, which showed the growing friendship between the two peoples. Meanwhile, during St. Patrick's Day, many Chinese landmarks including a section of the Great Wall were also lit up in green. Besides, the "Happy Chinese New Year" world-wide events initiated by Chinese Ministry of Culture and the two-week "Dublin Chinese New Year Festival" sponsored by Dublin City Council were both actively participated and supported by Irish state leaders, Department of Transport, Tourism and Sport, Tourism Ireland and local county councils. These strengthened exchanges have laid a promising foundation for bilateral cooperation. Fourthly, joint efforts are essential to tackle the challenges and explore the potentials for tourism cooperation. A lot more Chinese tourists are expected to visit Ireland in the coming years. Is Ireland ready? When I visited counties of Meath, Wexford, Cork and Waterford, they all told me they were getting ready. Are you all ready? I think people are always on the way of being ready, so let us roll up our sleeves and work with joint efforts. I am happy to learn that Tourism Ireland has been urging and helping the players in the Irish tourism and hospitality industry to "get China-ready", expecting to welcome 100,000 Chinese tourists per year after the direct flights come into operation between Ireland and China later this year. Some Irish friends spoke to me enthusiastically how they are planning to increase hotel capacity for expected growing of Chinese tourists. 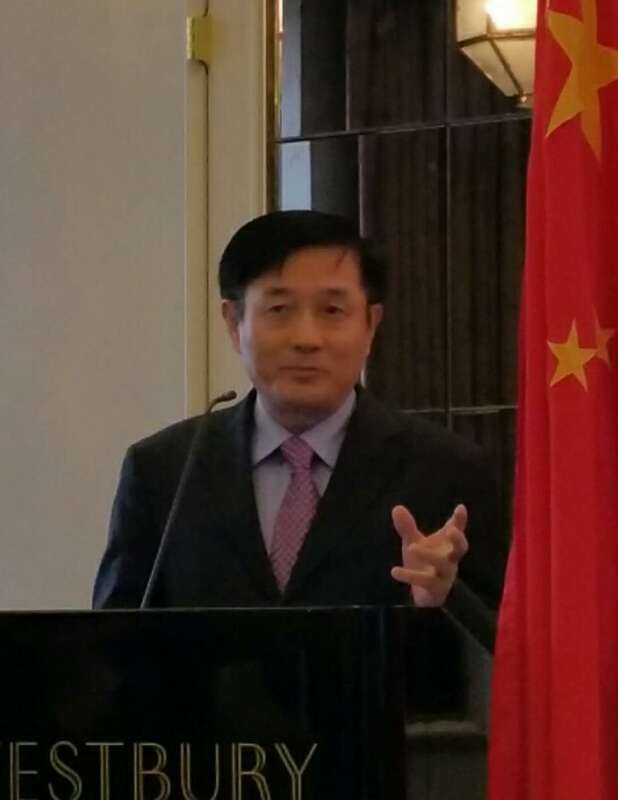 I would believe that the China-readiness requires things not only like the improved hotel capacity, payment methods and signages in Chinese, but also our joint efforts to promote two-way humanity exchanges including the facilitation of bilateral visa regime, easing of the formalities for travel or cutting down bureaucracy along the way in many related areas. We perhaps shall not only focus on the hardware but also pay more attention to software such as how to improve mutual understanding and strengthen communications between our two peoples to enrich our cultural, educational and local exchanges. This seminar demonstrates to my great delight the strong desire of Irish tourism industry to enhance its service and attract more visitors from China. It will be very useful and helpful at today's discussion and exchange of views if topics covering policy-making, business proposal and solutions are touched upon. We particularly welcome constructive suggestions to further explore the potential for win-win cooperation in the field of tourism, hospitality and travel. We are ready to work with Irish leaders in both public and private sectors to expand the China-Ireland Strategic Partnership for Mutually Beneficial Cooperation for a better and shared future. I want to mention another big event before concluding my remarks. The first China International Import Expo (CIIE) will be held in November in Shanghai. It is indeed a perfect chance for business. The tourism sector of participating countries will be a very important section in the Expo. Pencil in the time in your diary for the Expo and brighter future is just there in store.